Sports cards present many opportunities for both simple and multi-step speed-reading. Because all students participate in a sport at some level, they bring their Real World sports knowledge to the reading of a sports card. Any sport offers a similar advantage to your teaching – a body of Real World knowledge, specialized vocabulary, and sophisticated sets, or schema, of interrelated concepts and images – all sitting there in your students’ heads ready for focusing on speed-reading! What does it take for a player to get down the rink for a shot on goal? … and all read by the player. All read at speed. All read at speed within a huge field of vision … and we haven’t even picked up a sports cards yet! Demonstrate that not only can your students read, they can speed-read. Sometimes they may need to practice briefly to let their eyes work for them while reading print materials as well as they can read the hockey rink. Or skateboard park. Or highway. Here’s an abbreviated example for a simple and beginning activity in speed-reading. Split class up into a few groups of four or five. Ensure each student has a fistful of cards. Ask each group to make a list of all the information to be found on the photograph side of the cards. How quickly can each group find all the players on a single team. What do they look for to do this task quickly? Hey! The basics of reading – the asking of a question before reading … for which the reading provides the answer. Want to separate cards fast into teams? No problem. Just find the logos and … done! No corner logos? No problem. Kids will find their own feature to use for the task. Call attention to the analysis of the task and you open doors on understanding the skills that learners use all their lives. How does a 3rd or 7th grader shuffle through so many cards quickly to find all the goalies? Or (a two-step task) the Detroit goalie? 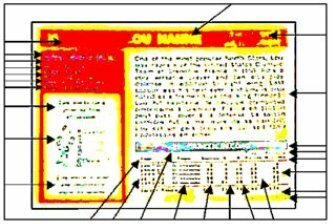 Speed-reading a sports card, like speed-reading any other format, requires the recognition of an identifying feature for acquiring information quickly. Besides their limited length, their structured presentation, and their portability, sports cards rarely pose a threat to open but anxious minds. Sports card speed-reading is problem solving practice with a finite deck of fun material. Sports cards hold dozens of combinations for the problem solving that speed-reading requires. It takes only a few steps more to apply these speed-reading skills to more traditional, School World, materials. Return from Teaching Speed-Reading from Sports Cards to Sports Cards hub page for even more sports card teaching ideas! Return from Teaching Speed-Reading from Sports Cards to Real World Content Advantage home page.